You already don't have to leave the house to order groceries; soon you may not even need to unpack them. Check out this project from MIT, Princeton, and Amazon. Whilst it's probably fair to say that grocery shopping has become more efficient in recent years, the process of taking items from the shelf, putting them into the basket, getting them out of the basket to go through checkout, packing them to go home, and then unpacking them into your various cupboards and fridge is a fuss that surely no one can enjoy. A robotic system developed by engineers from MIT and Princeton promises to one day help out. They've developed a robotic "pick and place" system that due to the smart grasping algorithm that underpins it, can automatically assess numerous items and determine the best way to grip or suction them. Once grasped, the item is then lifted from the bin, before cameras paired with an image-matching algorithm determine the right place for the item to be stored. Such pick-and-place technologies are not completely new, but they often have to function in very tightly controlled environments. The team want to develop robots capable of operating in unstructured settings, including retail warehouses as well as homes. The picking process was developed so that the robot can identify novel objects from a bin and use one of four grasping behaviors to gather it. The machine was trained using images of bins cluttered with objects, with each image labelled depending on whether it was graspable or not, and if so, which of the four methods the robot should use. 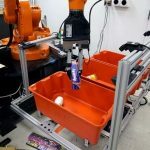 "We developed a system where, just by looking at a tote filled with objects, the robot knew how to predict which ones were graspable or suctionable, and which configuration of these picking behaviors was likely to be successful," the researchers say. "Once it was in the gripper, the object was much easier to recognize, without all the clutter." A perception system was then developed using a similar technique to allow the robot to recognize and then classify the object once it was in its grasp. Images were sourced from online retailers, with each image labeled to correctly identify it. An algorithm was then used to allow the robot to relate the pixels in the image with the label given to it. "We're comparing things that, for humans, may be very easy to identify as the same, but in reality, as pixels, they could look significantly different," the team explain. "We make sure that this algorithm gets it right for these training examples. Then the hope is that we've given it enough training examples that, when we give it a new object, it will also predict the correct label." Suffice to say, they are some way from the market at the moment, with early experiments revealing a 54% success rate in picking objects using suction and 75% with the gripper, but they are working closely with Amazon to develop the technology. It's part of a growing number of projects developing technology in this field, and it will be fascinating to monitor their progress. Check out the video below to see the robot in action.